Step 1: Gather your feathers together and pop them in place at the end of your BBQ skewer. Step 2: Using your twine start to wrap it around the skewer until the feathers are secured in place and then tuck the twine underneath itself to secure. Step 3: Time to get creative with your paint or nail varnish! Create whatever pattern you like running down the skewer. Step 5: Fold the card in half diagonally so you create an outline of two triangles. Step 6: Cut along the folded line and trim your triangles as needed. Step 7: Draw your pattern using a fine liner onto one of the triangles. Step 8: Using your glue secure the skewer in place and then glue around the edge of the triangle ready to place your other triangle on top. Step 9: Place your decorated triangle onto the glue and leave to dry. Step 10: Cut a geometric shape out of the card or use a scrap piece and write your guest’s name on it then glue to the end of your arrow! Pretty easy and fun right? These make for a great conversation point too, all your guests will be talking about their fun place settings! 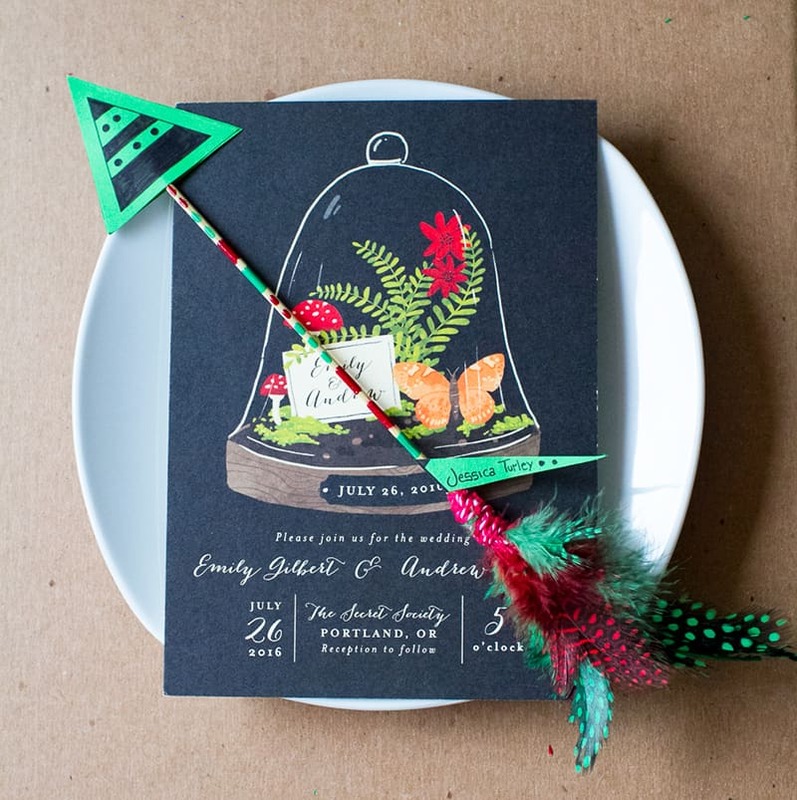 Also if you love those Bell Jar invitations as much as we do you can get your hands on them over at Minted!